As a gardener, I have wide swathes of time where my hands are busy but my brain is not. It’s left to wander down untended paths. On a recent ramble, it decided I should write a blog post on how gardening is like life. Or at least how my life is like my garden. One of the hardest lessons I’ve had to learn as a gardener is that, yes, I do indeed have to thin out my plants. ‘But, but, I…my babies? 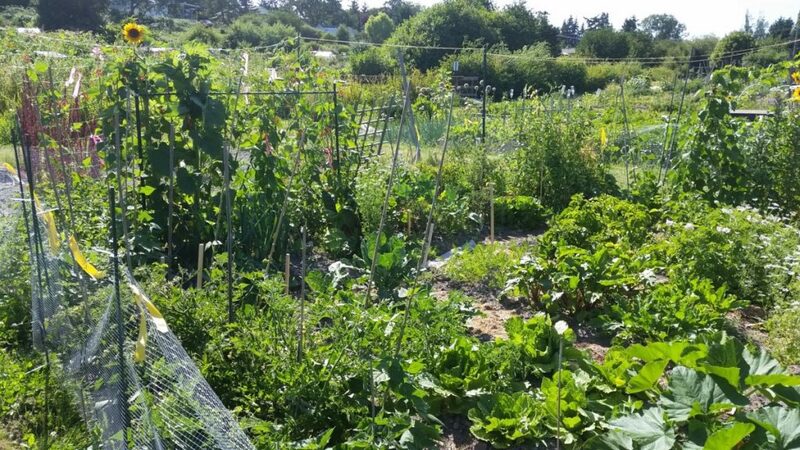 !’ I know, but if you don’t thin, you end up with overcrowded beets and twisted carrots (which can be kind of cool), and sometimes too many plants for your trellis to support. Then everything crashes down around you. It is kind of like life. You have to thin things out to leave room for other things to grow. I would love to get back to watercolour, and doing more art in general. But I’ve made the choice that my priorities for my discretionary time are writing and gardening. When I have a good couple of hours to work on a creative endeavour, it’s usually going to be writing. I’ll dabble in sketching and painting, but really pursuing that interest will have to wait. So at the end of the season last year, I had a problem – a bunch of dead plants and no real compost bin. I had the brilliant idea of burying the dead plants. 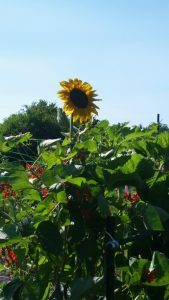 My plot floods in the winter, and I figured ‘they’ll breakdown in the ground’, so I buried tomatoes, bean stalks, sunflowers. And when I dug over the garden in the spring, it seemed like it had mostly worked. Then a volunteer sunflower popped up, and another one, and…five more. I wasn’t too concerned at the point – though I realized that burial might not be the way to go – because I had only grown dwarf sunflowers. They wouldn’t disturb the bean lean-to too much. Well, either sunflowers do grow true, or I had a tall one in the bunch. This holds true in life as well – if you bury your problems, more often that not they’ll come back to haunt you when you least expect it. On the flip side, I now have a bean bed full of sunflowers, which make me happy and the bees love (which also makes me happy). I could have pulled the sunflowers up when they started to grow, but I decided to leave them and see what would happen. I’ve stumbled into a number of decisions in my life, times where, if I’d done the full cost-benefit analysis, I probably would have gone the other way. Moving to Ontario, leaving my one job there for another, going overseas to teach English. These would have been the ‘wrong’ decisions, even though they were great choices that led me to where I am today. Heck, even the fact that my previous apartment hummed after they ‘fixed’ the water issues. It was so loud I had to move. I wasn’t happy about moving at the time, but I found a great apartment, and that previous apartment building did a bunch of spit-and-polish renovations about a year after I move and then jacked the rents up. But the garden gives me a chance to work on my patience. How many times have a looked at a patch of dirt where I planted some seeds and I think to myself ‘nothing seems to be happening there’s nothing there maybe all the seeds were duds why is nothing growing maybe I should replant’, then BOOM, knee high plants. I know this, and yet I still need to remind myself to give things time to grow. I could have added a lesson about pests: sometimes you just need to accept them, sometimes you need to squish then with vehemence. But I need to go deal with the bounty of my harvest. What about you? Are you a gardener who has learned some lessons from the garden? Or do you have another hobby that teaches you about life?